I am back in Tucson and in the spring when it's getting hot here. I plan to take a shuttle back up to Flagstaff, then spend some time there a while. Then bicycle up to Mt Carmel in southwest Utah. I retired last spring early on Social Security and plan to spend next summer hiking, camping and cycling around Utah, mainly in the Zion and East Fork Virgin River area. 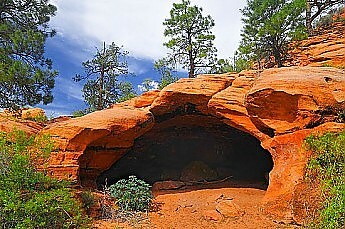 I want to refind a seep cave we stayed near along Poverty Wash Canyon. I may use it as a base to explore the canyon country there. Southern Utah has it all. Next year Death Valley,. spring in Sequoia, fishing in my boat, backpacking near Carson Pass, fall in Utah. A road trip to Seattle to see family . One week on a river. Day hikes out the back door. I don't go because I like it, I have to go. I do go cause I like it. Glad to still be able to, I will be 63 in January. I don't go because I like it, I have to go. There was a thread a while back about the change that washes over the hiker after a few days in the BC. Your statement reminded me of the sensation I get when the wilderness takes me over. I am drawn by the siren song of the land, in the raucous greeting of the Steller's Jay, in the stirring of the pines and from the distant wind blown summits, gently whispering out my name and beckoning further and deeper. As we used to say, Ed. Your'e a poet but don't know it! I go because I like wildness better than civilization. I miss my younger years when I spent 9 months outside and 90 days inside working. While I don't huff the many miles a day I used to I still like going and being surrounded by the closest thing to Eden there is left. I always figured I'd retire a mountainman when I was 40, but a few years before that birthday I got married, had a child and then divorced a short time later, only to pay support till she was 18. Now I hope to revert back to being outdoors more and in town less. As Muir said, Go to the mountains and get their good tidings and your care's will fall away like the leaves of Autumn. This forum: Older: Renting gear? Newer: 3 - Day Backpacking Loop in May? All forums: Older: Review Your Gear to Win $450 MSR Winter Gear Package Newer: Opinions on the Salomon XA Pro 3d?